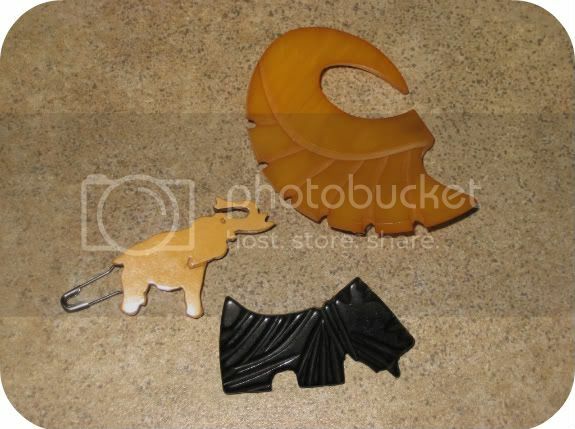 Only about a year or two ago did I get into collecting bakelite. I always thought it was super expensive and lets face it, I'm not about to pay $100+ for some plastic. However, I have been lucky enough to find some great pieces at estate sales, vintage shops, and eBay that were all within my price range. When I started collecting, I knew little to nothing about bakelite. I am still continuing to learn about the ins and outs of collecting bakelite, but I thought it would be fun to share my collection. I love seeing other vintage blogger's collections, especially when it comes to jewelry. Holly has done an excellent post on bakelite and I would definitely check it out if you are looking for a thorough history and detailed guide. I would also check out the above book. I was really impressed with the information provided in the book. Plus, it has some wonderful pictures! 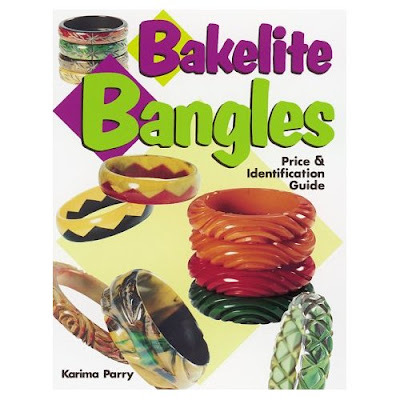 As a side note, most of the information provided about bakelite in this post came from the above book. There are many ways to test a piece to see if is bakelite, however, one of the interesting things I learned from Parry's book is the discoloration factor. 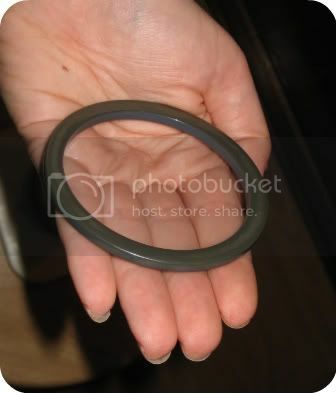 I recently just came across this a few weeks ago when I found a set of what I thought was green bakelite bangles. Once I picked up the pieces, I noticed the insides and outsides of the bracelets were different than the tops and bottoms (the parts that rub up against other bracelets). I'm not good at the "rub and sniff" test, so learning about this other way to possible spot bakelite has certainly come in handy. When I got home and I tested them with simichrome, they passed as bakelite. One thing I wanted to note that Parry says in this book is that not all bakelite will pass the simichrome test and some fakelite will pass the simichrome test, so it's important to use other methods to test pieces as well. 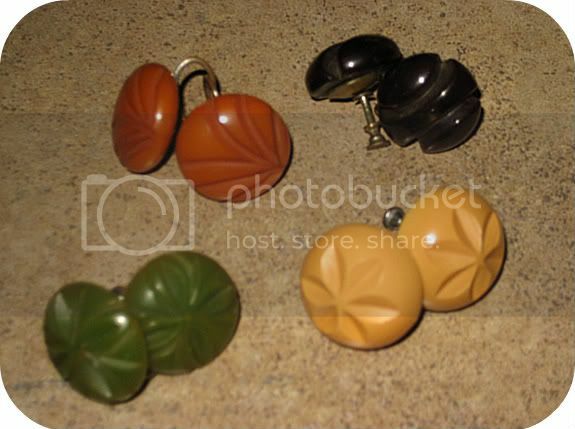 With the bracelets above, the tops and bottoms had wear on them and the discoloration helped to ensure that these pieces were indeed bakelite. 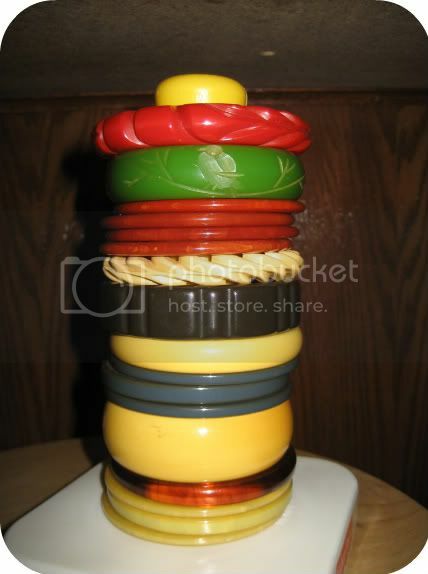 Here is my collection of bakelite bracelets. I don't have a lot of fancy pieces, but I am slowly adding to my collection. I have worn a lot of these in my previous posts, so now you will get a chance to see them up close. I always forget to take close-ups of my jewelry for my blog posts. Creamed Corn Carved - Midland Flea Market $5! Forest Green Carved - eBay $15! Yellow Bangle - Estate Sale $1! Set of three Teal Bangles - Estate Sale $2! Stud Earrings - My Favorite!! 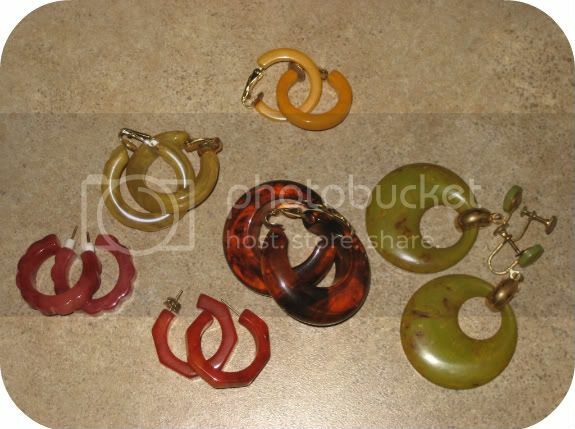 All the hoops above were found on eBay except for the yellow brownish carved pair just to the left of the root beer hoops. Those were found at an estate sale for only $2! As you can tell, I have found most of my bakelite on eBay and honestly, I think you get the best deal there if you look hard enough. I have been ripped off in person at flea markets where I have absolutely no recourse what so ever. At least with eBay, you are protected if you pay with PayPal. Finally, here is a great youtube video that talks about the different ways to test bakelite. I hope you find it as helpful as I have. Those yellow bangles from your grandmother are great! You have some beautiful pieces! Thanks for sharing them with us! Love this pieces..so chic and vintage! I'm a huge fan of your blog...thank you for sharing. I have just bought a yellow Bakelite ring on which I have not done an authenticity test yet. problem is that it discolours the finger of the wearer nearly immediately.